I wrote recently about Alfred Hitchcock’s film The Birds as a meditation on Sin here. Hitchcock also explored the effects of Original Sin in his classic work Psycho. Often this film is touted as the first classic modern horror. However classifying this film as a horror or thriller, does not do the film justice as it is a penetrating study of human sin and evil. The main focus of this study is the films villain Norman Bates. Bates initially appears to be an affable young man who runs a hotel. Behind the hotel is a creepy looking Victorian home. The home is symbolic of the way that the past haunts Bates. Bates is a man with a secret. In a fit of jealous rage he killed his overbearing mother, however he cannot face his guilt. His mothers influence is so great over him, that she still rules him from the grave. Hitchcock allows you to think until the final scene that the villain is Bates’ mother. Bates’ has been living a double life, he dresses up and acts as his mother, as her voice lives on in his psyche. The film is a powerful warning of the way that the past can rule over us, how the influence and voices of others can overtake us. Hitchcock shows us how evil can grow even in the seemingly benign soil of a mother and son relationship. How codependency can ruin natural relationships and how the past can reach out and strangle the future. The film illuminates the way that the influence of the past can burrow beneath our skins and fester in the hidden parts of us, keeping us in an invisible prison. Norman Bates is a modern day incarnation of Lot’s wife. Both illustrate the way that the past can move one towards sin. The story of Lot’s wife is a fascinating one. One short sentence speaks volumes. 23By the time Lot reached Zoar, the sun had risen over the land. 24 Then the LORD rained down burning sulfur on Sodom and Gomorrah—from the LORD out of the heavens. 25 Thus he overthrew those cities and the entire plain, including all those living in the cities—and also the vegetation in the land. 26 But Lot’s wife looked back, and she became a pillar of salt. One of the strong overwhelming themes of the book of Genesis is newness, the new things that God is doing in human history to right the wrongs of the fall. The story of Lot’s wife in all of its strangeness makes a clear point, Lot’s wife does not simply look back to the past, she looks back with a yearning heart to the city of Sodom, a city that represents all of the violence and injustice of the fall. 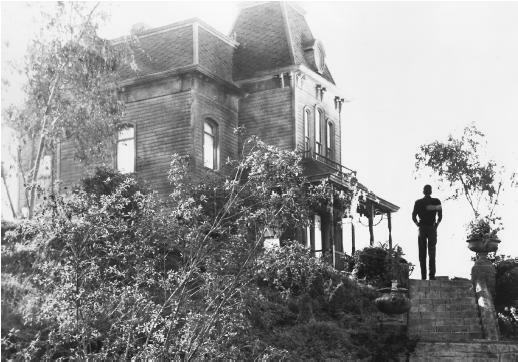 Norman Bates is the same, he looks backwards to the dysfunctions and twistedness of the past. It is interesting that Lot’s wife is turned into salt, something which the desert is filled with, something which kills plants, and destroys soil, and prevents new growth. In contrast to Lot’s wife we have the figure of Abram, who too hears a call to leave behind the past, to embrace the new things that God is doing; sometimes he wavers, sometimes he fails, yet he doggedly maintains the path of faith, towards God’s future of newness.